Today, Russia is in the grip of one of the most dramatic blagoustroistvo campaigns in its modern history, and Moscow, as usual, is in the epicenter of it. As geographer Natalia Zubarevich points out, in 2016 and 2017, the Moscow city government spent previously unheard of amounts of money just on blagoustroistvo — over 15 per cent of the municipal budget, 16-17 times more in real terms than any other Russian city or region spends today. 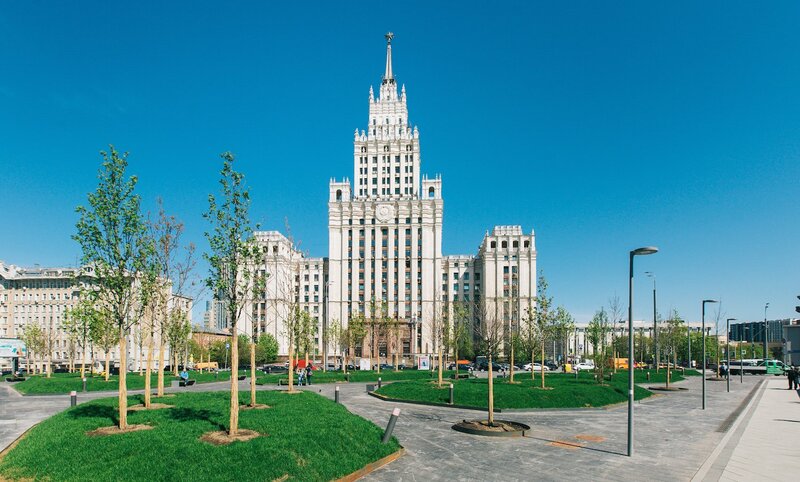 In terms of scale, zeal and extravagance, Moscow is currently arguably in the midst of the most important transformation of its centre since Stalin’s time; and of the most uncompromising reconstruction of its inner and outer peripheries since Khrushchev’s mass housing campaign. The current wave of blagoustroistvo began, on some accounts, on a yacht in Venice 2009, when entrepreneur and journalist Ilya Tsentsiper convinced oligarch Alexander Mamut to sponsor the foundation of the Strelka Institute for Media, Architecture and Design — an innovative, interdisciplinary educational institution. Its first Programme Director was Dutch starchitect and Russophile Rem Koolhaas. Strelka’s task would be to train a new interdisciplinary generation of architects, who would also be designers, critical theorists and tech gurus all at the same time. In 2012, Vladimir Putin announced the foundation of a brand new park, Zaryadye, on the site of a demolished Khrushchev-era hotel directly adjacent to the Kremlin, Red Square and St Basil’s Cathedral. In the bidding process for the project, Strelka pulled off a herculean effort; the competition was won by uber-hip, Deleuze-citing New York practice Diller Scofidio and Renfro, authors of the Manhattan High Line and countless other blue-chip projects. Thanks to Strelka, Moscow would receive its first showcase piece of foreign-designed contemporary public architecture since Le Corbusier’s Tsentrosoyuz Building of 1933. Soon after, in September 2013, Strelka’s consulting operation was separated from its educational and publishing wings, and registered as a separate company, Strelka KB (Consulting Bureau). In 2014, Strelka KB moved from its ramshackle offices in the old Institute classrooms (adjacent to Strelka Bar) to bespoke offices in the adjacent former Red October chocolate factory. 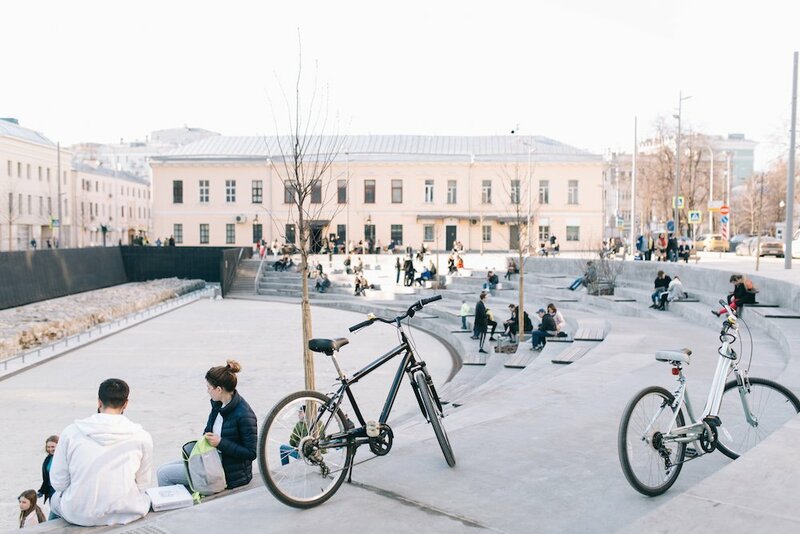 In January 2015, Strelka KB won a 900 million rouble ($13.4 million) contract, awarded by the Moscow city government, to develop the standards for the blagoustroistvo of the capital streets, named My Street (Moya Ulitsa). Despite the company’s meteoric rise, it is Moya Ulitsa that remains the pride and joy of Strelka. And by many accounts, indeed, Moya Ulitsa has so far been a roaring success. According to its own (methodologically more-or-less dubious) criteria, blagoustroistvo has led to 23 per cent more pedestrians on city centre streets and a threefold increase in both the number of Instagram photos taken on Tverskaya and in the number of children photographed on Novy Arbat. 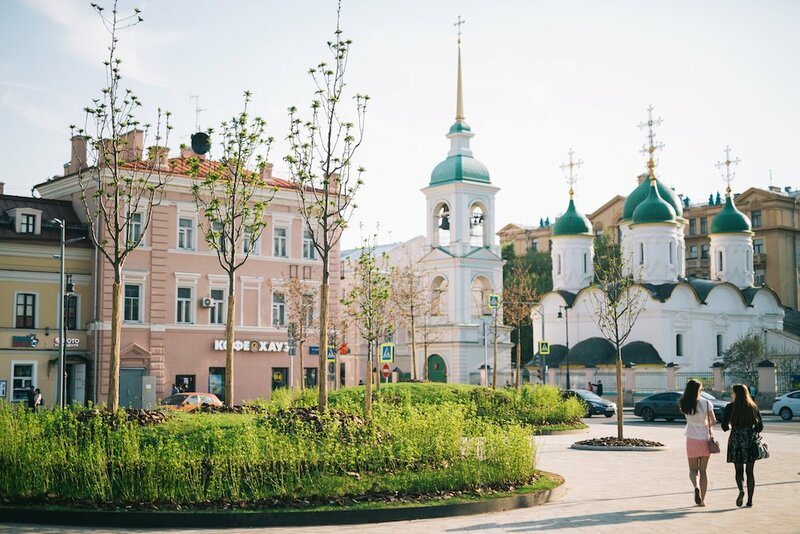 Moya Ulitsa has also led to a one third growth in restaurants on Tverskaya, versus an 18 per cent decrease in the number of banks on streets which underwent blagoustroistvo. Moscow’s urban fabric is constantly shifting under the weight of endless renovation, demolition and construction. Such an extensive and long-term project as Moya Ulitsa throws up some curious tell-tale signs, themselves becoming part of the furniture in the average Moscow street scene. One such artefact is the paving stone. 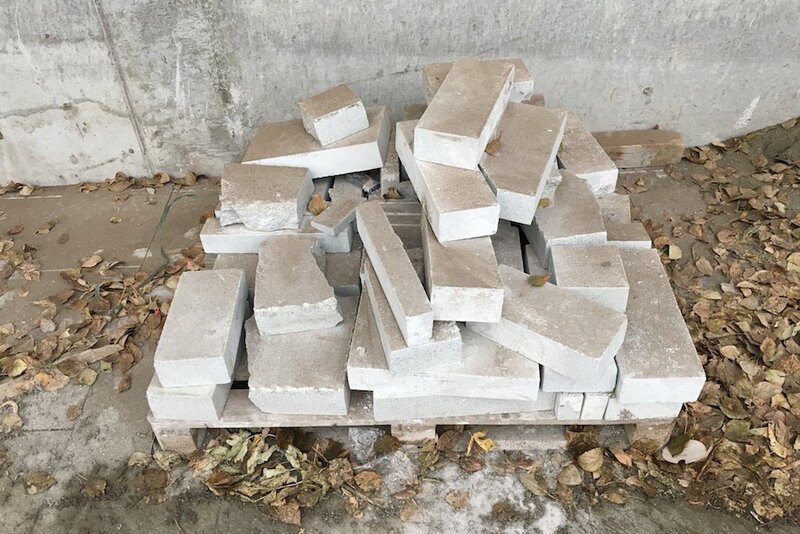 Evert Muscovite can tell you that the city is littered with piles of brand new granite pavement stones, waiting to be laid into the ground by armies of jumpsuit-clad workers, the vast majority of them gastarbaiters from Central Asia. Plitka — the Russian word for tile or paving stone — is one of the words that defines Moscow under current mayor Sergey Sobyanin. Political theorist and journalist Sergey Medvedev has gone so far as to christen the Sobyanin years the “era of plitka”. Once they have been liberated from their packaging, but before coming to their final resting place in the ground, the piles of plitka are laid in a bewildering array of formations throughout the city. In and around Zaryadye Park, the distinctive hexagonal plitka custom-designed for the park tend to be arranged into mysterious, Stonehenge-like circular portals. In the revolutionary centenary year of 2017, as the museums of Moscow (and the world) put on blockbuster shows celebrating the art of the Soviet avant-garde, the plitka of Moscow was arranged into quite spectacular formations, which often bore an uncanny resemblance to the abstract art of the early 20th century. Plitka is not the only material artefact of Moscow blagoustroistvo whose deployment has achieved a remarkable level of poetic and semiotic depth. 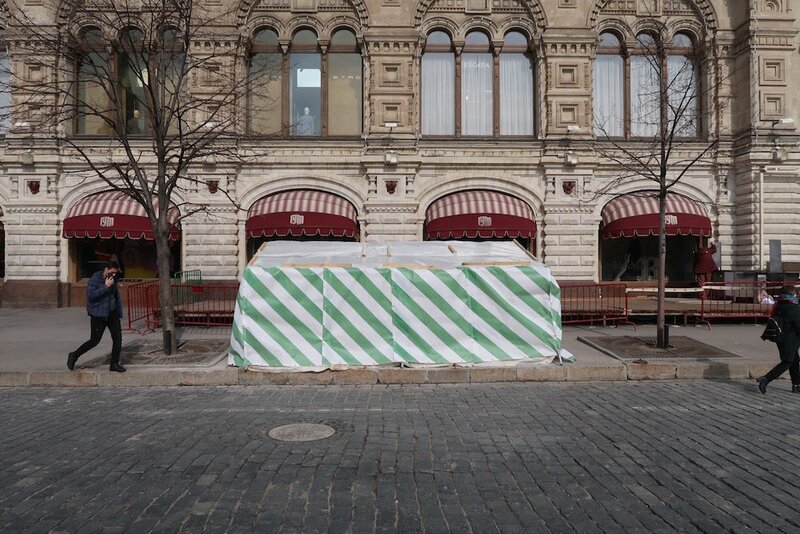 This is even more true, perhaps, for the white and green banners (or falshfasady — “false facades”, as they are sometimes non-derogatorily called in Moscow) that have been a staple of the Moscow landscape since the second year of the Moya Ulitsa programme in 2016, and which represent the official visual brand of the blagoustroistvo programme. The distinctiveness of their design and their sheer extent of their proliferation during the most intense summer/autumn phases of blaogustroistvo quickly endowed these banners with an iconic status — it was difficult to take a photograph in central Moscow during the warm months of 2016-2017 without a falshfasad making its way into your shot. The falshfasady very quickly became an object of artistic, fashion and design inspiration. White-green striped “Sobyanin socks” and “Sobyanin dresses” became must-wear items (and Instagram staples) of 2017. The total distribution of the stripes throughout Moscow’s cityscape and popular culture was no doubt a function of the successful work done by Strelka KB’s graphic design team; but it was also an index of the vast scale of the Moya Ulitsa programme. The ambitions of Strelka are far-reaching. Looking beyond blagoustroistvo, with regard to Strelka’s eye on the housing construction sector, CEO Denis Leontiev has made clear his stated ambition to eradicate the institution of the developer, an unnecessary intermediary between the client and the construction firm; and to completely replace it with the institution of the architectural consultancy. “I call into question the existence of the developer ten years from now,” Leontiev says. Yet, despite this grand quest, even on the home terrain of blagustroistvo, Strelka’s main contribution so far has been to introduce yet another intermediary, that of the specialist architecture consultancy, into the mix. And the project was not destined to remain limited to the capital. At the end of 2010, Russia had been announced as the host nation of the 2018 World Cup and federal authorities were bracing for a new wave of blagoustroistvo in its 11 host cities in preparation of the most prestigious and profitable mass spectacle on the globe. Strelka KB, buoyed by its success in Zaryadye Park, was awarded the right to beautify the World Cup cities along the lines of Moya Ulitsa. Things didn’t end there. The project of blagoustroistvo in the World Cup host cities mushroomed and mutated – first into a programme for the development of World Cup fan zones in 40 cities; and eventually into a 3.8 billion rouble ($61 milion) blagoustroistvo project encompassing 235 public spaces in over 40 cities within the framework of a 42 billion rouble ($645 million) federal blagoustroistvo project led by Dom.rf and the Ministry of Construction. The remit of this contract is even broader, encompassing also the development of flexible blagoustroistvo development projects for 319 specially-earmarked former single-factory “monotowns” (many of them plunged into poverty in the 1990s following the collapse of the Soviet Union’s industrial base); and, more broadly, non-binding blagoustroistvo guidelines for 1,112 cities further cities throughout Russia. Since its foundation in 2013, Strelka KB has grown to over 300 employees: architects, urban planners, analytics, economists, anthropologists, designers and communications staff. In other words, it has grown — in the space of just five years — into a hyper-centralised “urban consultancy”, almost certainly the only such institution of this kind in the world operating at such an enormous scale. In other words, it is a privately-financed central project bureau, the likes of which even the Soviet Union never saw. So what is the political effect of plitka and blagoustroistvo? 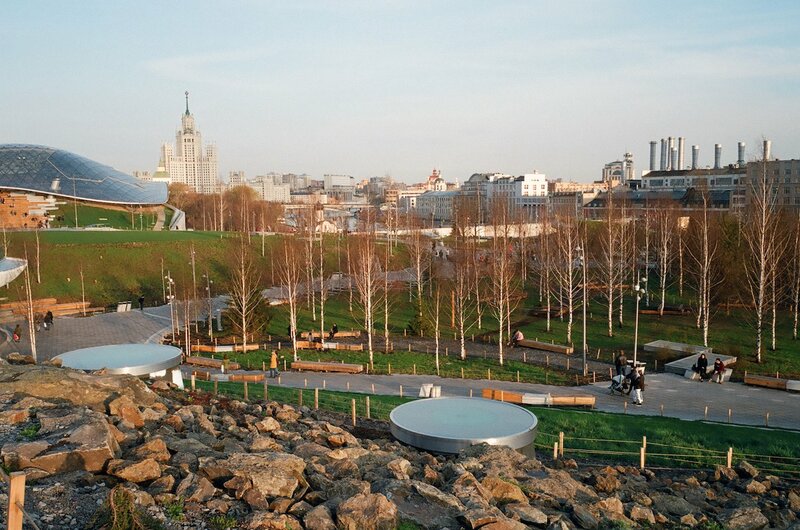 The official line, according to Strelka and the ideological fellow travellers of blagoustroistvo, is that Moya Ulitsa, as well as other public space-focused projects, of which Zaryadye Park is the flagship example, constitute machines for the engineering of freedom. At a recent roundtable which I organised together with my students in Moscow, the geographer Olga Vendina argued that with Zaryadye, “an artificial environment is created, which emphasises and enables freedom. And when this kind of space of freedom appears adjacent to the sacred spaces of power and secrecy, then this can only mean one thing – the desacralisation of power.” Zaryadye Park — and public space in general, of the Moya Ulitisa variety — is literally represented here as an architectural tool for the engineering of people’s freedom. And this more or less the entire theory behind KB Strelka’s approach to public space. Given the scale of the Moya Ulitsa project and its offshoots across Russia, how successful this engineering of freedom proves could yet change the face of the country.